View cart “Chuck van Zyl: Rituals (CD)” has been added to your cart. Celestial Mechanics’ origin extends back to the era of tape. The 1980s found Chuck van Zyl recording spacemusic and releasing it on audio cassette. Synkronos Music put out a trove of releases, including The Moment of Totality (1990) and Callisto (1989). Each cassette held two side-long pieces of music, and established a series of releases by van Zyl representing his enthusiasm for astronomy and the cosmos. Released on CD in 1993 by Scotland’s Centaur Discs Ltd, that original CD has been out of print for years. But thanks to the Philadelphia-based industry8 label, Celestial Mechanics is back with us, re-issued, re-mastered and treated to modern audio enhancements, and a much improved fidelity. Housed in a limited edition, four panel digipak, and adorned with vivid NASA probe images, it offers the opportunity to encounter the significant backstory to one of our community’s most unique members. 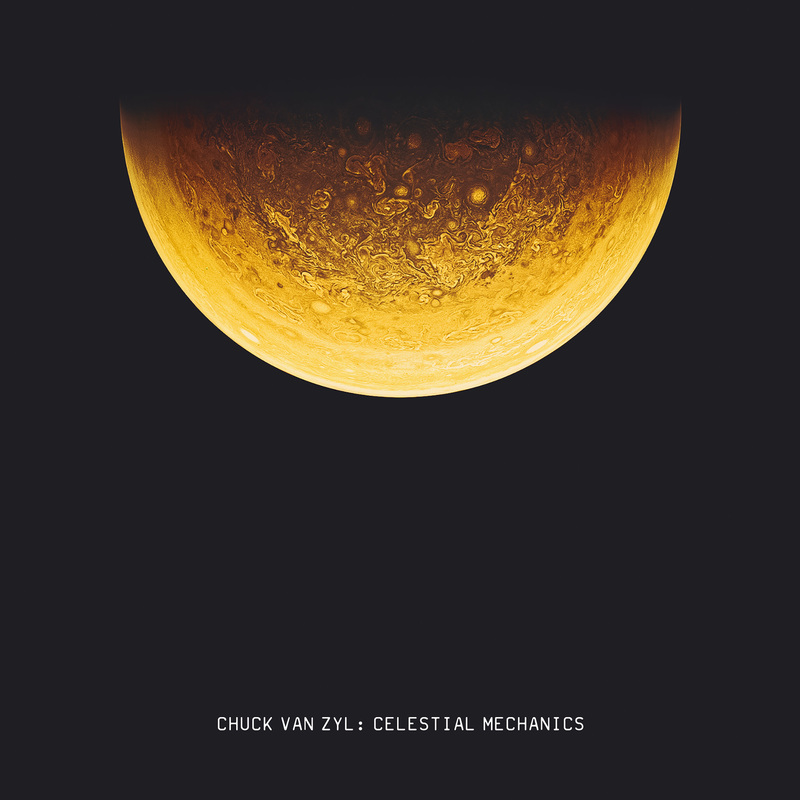 So Celestial Mechanics may be viewed as compiling these early works onto a CD, and getting them out before the public… and that is exactly what Centaur Discs Ltd of Scotland did in 1993 – thus presenting Chuck van Zyl to the world beyond his small mail order following. That original CD edition has been out of print for some time now. But thanks to the Philadelphia based industry8 label, Celestial Mechanics is back with us, re-issued, re-mastered and treated to modern audio enhancements, and a much improved fidelity. Housed in a limited edition, four panel digipak, and adorned with vivid NASA probe images, it offers those interested listeners and collectors the opportunity to encounter the significant backstory to one of our community’s most unique members. Inspired by space, the physical universe, and all of its intricacies, as well as by classic Kosmische Musik works from out of the 1970s Berlin-School, van Zyl realized the four pieces found on Celestial Mechanics as personal electronic odes – to the four Galilean moons of Jupiter, and the astral motions of the solar system. Clearly influenced by Crystal Lake and Rubycon, as well as by the direct mentoring of The Nightcrawlers (the NJ Space trio with which he was so closely associated), the release of these cassettes found van Zyl himself finally making music that, not only properly portrayed his cosmic yearning, but was representative of the restless, creative spirit which inhabits him to this day. As we listen to Celestial Mechanics, we can feel this world of discovery still living on. The repeating music box sequencer intro of the title track immediately turns our thoughts to the virtues of The Universe as a place of possibility and wonder. Sounds build out, and additional lines of rhythm are introduced. A magic machine pulse provides a distinctive energy, one more of the mind than of the air. Confirming synth lines surface – reassuring the lost, and arousing the adventurous – with dramatic chord changes helping us ascend further still. As we pass through eerie amorphous interludes of drones, metallic tones, and wondrously modulated aural accents, the mounting tension resolves. The emergence of an ever repeating pattern of echoing bass notes supports the lilting melody of a soft synthesizer lead. Minimalist sequencer runs motor on, then gradually brighten. Individual notes are transposed and repeated, minutely altering the pattern and quickening the music’s pulse. After a few variations in momentum, the music slows, and expends its previously built mass in thoughtful repose. Transitioning out of this energetic phase, the magical beauty of its closing section solemnly brings Celestial Mechanics to its conclusion. While Celestial Mechanics includes all of the texture and atmosphere the Spacemusic genre is known for, its biggest success is in its entertainment of a most unusual idea… of traveling while being still. New musical territory can only be discovered once… and Chuck van Zyl has built profoundly on all of his finds, using them as reference points – in a field that is inexhaustible. Limited 1st pressing of 100 signed and hand-numbered copies.